The first sign that this notebook is serious about work is that it comes with a fingerprint reader, so instead of entering a password to log on, you can set it up to recognise a fingerprint to grant access. It’s good for those carrying sensitive information and for anyone who can never remember their passwords. This notebook will fit into any standard backpack and its weight, which is about the same as a large hardback book, means you do not have to be a contender for the title of World’s Strongest Person to carry it around. Fortunately the keyboard and mouse touchpad do not suffer from the PR210’s diminutive size and we were impressed at how easy both were to use. The keyboard, although smaller than average, was stable and easy to type on – almost as comfortable as a standard-sized one. 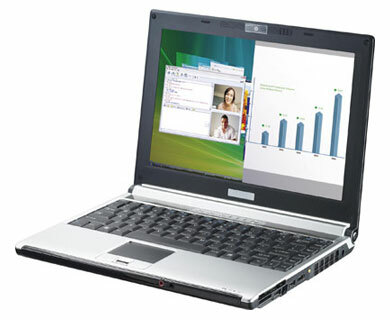 The computer’s battery protrudes a little at the bottom, propping up the keyboard at a slight angle, which can make typing easier. The touchpad, which was bigger than we expected, was extremely smooth, making navigation easy and dispelling any need for an external mouse, something that’s often a necessity when using a notebook PC. According to MSI, the 12.1in widescreen display is an anti-glare model, but we found it to be quite the opposite. It suffered from terrible reflection off lights which made playing games or watching films difficult. 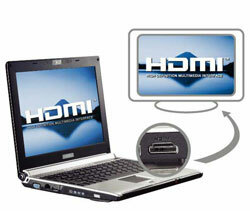 However, an HDMI socket allows the notebook to connect to newer flat-panel TVs and monitors in the highest possible quality. The AMD Turion64 X2 processor, running at 1.86GHz, is adequate, but the (also adequate) graphics card uses some of the 1GB of memory, leaving a very small amount left for general work. It’s fine for office work and web browsing, but it strained to run several applications at once. Our labs tests bore out the PR210’s shortfalls in gaming and video, so although it has an excellent four-and-a-half hour battery life, that’s going to be four hours of work, rather than watching an epic movie. It comes with Vista Home Premium and Works 8.5.